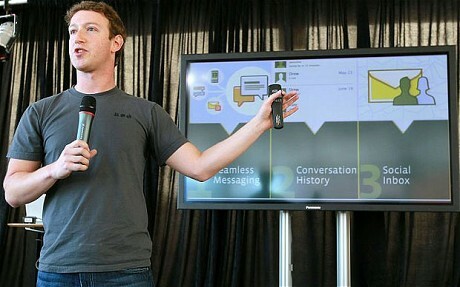 Yesterday I sat and watched Mark Zuckerburg and Andrew Bosworth announce the trial of the new Facebook messaging system. I am left with two conflicting thoughts and so am slightly troubled. Firstly, the words and phrases they used to describe the new system sounded great ; “immediate”, “personal”, “simple”, ‘minimal”, “short” and best of all, “technology getting out of the way”! But then watching the demonstration and hearing how it would work with outside clients (including Gmail! ), left me quite befuddled! By no means am I a tecchie, which was why the language was so appealing. So expecting to then see a super simple to understand product, I felt slightly let down and confused. I get the objective – to consolidate all your online conversations with people into one stream (including SMS). The analogy used by Bosworth was his Grandmother’s box of letters sent to her by his Grandfather that she lovingly cherishes – “where’s my box of letters?” he said. The announcement had been teed up in the press as a Gmail killer and when Zuckerberg claimed ‘Gmail is a really great product”, I was left waiting for the ‘but’, which never came. Even after hearing that “Email is still really important to a lot of people”, I could sense that by people he meant ” sad old people”, but then what we heard was that users of this new product could claim an @facebook.com email address! Search Engine Land’s comment, “Whatever-you-do-don’t-call-it-email-but-hey-here’s-a-Facebook-email-address-for-you email and messaging system”, raised a smile! I do get the fact that for a lot of people email is outmoded. My wife says she has “emailed” someone, when what she means is that she has sent them a message on Facebook, so it’s not just the college kids he met, who Zuckerberg claims were the inspiration behind this product, who don’t use email because it’s too slow and informal. But I remain unclear as to just what has been created here. Over a year in development, commanding more internal resource than Facebook have ever committed to a project before, this is clearly seen by them as a gamechanger. If it really is simple, easy, short, personal etc etc and really does get the technology out of the way, then I can’t wait. (I’ve applied for an invite to test this thing, so will report if lucky enough to be granted one), but right now I just can’t picture it. Can you help me shed some light on this?